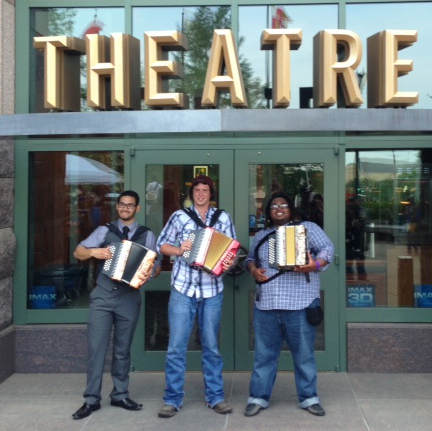 Texas Folklife will bring its annual celebration of the state’s accordion roots music to Houston’s Miller Outdoor Theatre on Saturday, June 6, at 7:00 p.m. In keeping with its mission to preserve and present Texas’s diverse musical heritage, the festival will feature stars and legends in polka, Cajun zydeco, and conjunto. This year’s accordion stars will include Debra Peters and the Love Saints, Jerome Batiste and the Zydeko Players, and the Grammy-winning Los Texmaniacs and special guests National Endowment for the Arts National Heritage Fellow Flaco Jiménez, Augie Meyers, and Rick Treviño. 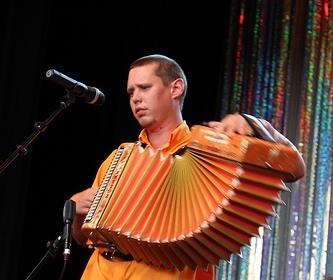 The accordion stars will be joined onstage by this year’s Big Squeeze Grand Prize Winners: Elizabeth Kelley (Cajun/Zydeco), Brandon Hodde (Polka) performing with the All Around Czechs, and Rito Peña (Conjunto). The Grammy-winning Los Texmaniacs hardly need an introduction. The band is comprised of founder Max Baca on bajo sexto, Josh Baca on accordion, Noel Hernandez on electric bass, and Daniel Martinez on the drums. Los Texmaniacs won the 2010 Grammy award for Best Tejano Album, Borders y Bailes, on the Smithsonian Folkways label. Their sound has been called “hip music everybody can relate to” and is comprised of conjunto, rock, and rhythm and blues. Los Texmaniacs will be joined onstage by National Heritage Fellow Flaco Jiménez, who recently won a Grammy Lifetime Achievement Award and has been called the “King of Conjunto,” Augie Meyers, and Rick Treviño. It will be a special night as the new Texmaniacs CD, Americano Groove, will be released. The album was produced by Steve Berlin (of Los Lobos), and includes vocals from a roster of Texas music royalty: Alejandro Escovedo, Joe Ely, Kevin Fowler, and Rick Trevino. Additional guest musicians include David Hidalgo (Los Lobos), Steve Berlin, and Augie Meyers. It's a mix of five traditional conjunto tracks, three country tracks, and four others that blur genres between rock and TexMex. Jerome Batiste and the Zydeko Players will bring the Cajun/zydeco beat to the festival this year. Batiste has described himself as a “Creole Cowboy,” and has described the type of music he and his band play as a little bit of everything—Cajun, Creole, jazz, zydeco, blues, rock & roll, and reggae. Based in Crosby, Texas—on the Louisiana side of Houston—the band spreads the gospel of Zydeco Nation throughout the region. Debra Peters and the Love Saints hail from Austin where they perform a mix of sounds—blues, zydeco, polka, western swing, and classic country. The band has traveled around the globe playing their blend of Texas roots music. Ms. Peters is also an educator. She has created a series of educational videos and teaches the accordion with a special emphasis on encouraging young women to take up the national instrument of Texas. This year’s event will again be co-emceed by writers and radio hosts Joe Nick Patoski and Tony Diaz. The festival is free and open to the music-loving public. Festivalgoers wanting seats in the pavilion area can pick up their free tickets the day of the festival at the Miller Box Office or become members of Texas Folklife and receive reserved tickets in advance. One of the important ways Texas Folklife carries out its mission is by introducing the culture bearers of the past to the culture bearers of the future. This will be on display at the 26th annual Accordion Kings & Queens Festival as the three young winners from the Big Squeeze Accordion Contest take to the stage to play with these powerhouse performers. Not only will the young players benefit from this joyous musical connection, but those lucky enough to be in the audience will have the opportunity to witness this generational passing of the torch. Austin, Texas – January 15, 2014 – Texas Dance Hall Preservation, Inc. and Texas Folklife announce their partnership to produce the Texas Polka Festival & Symposium to be held in Schulenburg on February 22, 2014. With support from a Humanities Texas grant, the event will feature the state’s European polka traditions of German, Czech and Polish heritage. The Festival & Symposium will be held at the historic Sengelmann and Turner Halls in Schulenburg and will feature esteemed Texas polka musicians and exhibits and discussions on European history, dance hall architecture, food, music and dance in Texas. Bands performing include The Boerne Village Band (German), Brian Marshall (Polish), Czech Melody Masters, Mark Halata (Czech), and special appearance by Santiago Jimenez Jr. (Texas-Mexican.) 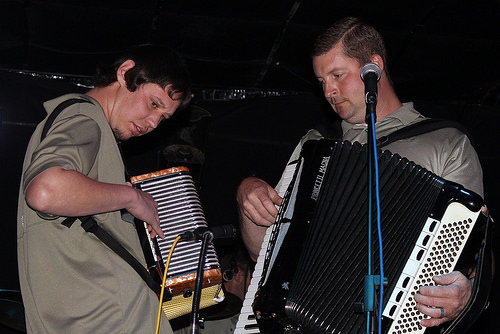 The program will include a showcase of up and coming polka accordionists in the state as part of the Big Squeeze Accordion Contest produced by Texas Folklife. Other polka master musicians will be presented in panel discussions on the history of the music and efforts to preserve and promote polka in Texas. A symposium portion of the program, sponsored by Humanities Texas, will include discussions by scholars and lay cultural workers on the history and culture surrounding polka music in Texas. Confirmed speakers include Patrick Sparks and Steve Dean of Texas Dance Hall Preservation, Inc. (TDHP), Dawn Orsack and Lori Navar of PolkaWorks moderating a panel on food, John Novak and Frances Burton on documenting Texas Czech songs, and Dan Margolies and Cristina Ballí on sustainability of Texas polka music. More speakers are being added to the program and updates can be found at www.texasfolklife.org. The festival and symposium will take place in two historic dance halls in Schulenburg. Activities will begin at 10:00 AM at Turner Dance Hall, with a welcoming of accordion music and kolaches to view an exhibit on Texas dance halls. Panels and music presentations will then move over to Sengelmann Hall (531 N. Main Street) at noon for the rest of the program, to last until 9:00 PM. Presentations at Turner Hall are free and admission to the festival at Sengelmann Hall is $15. Tickets can be purchased at www.texasfolklife.org. The Texas Polka Festival and Symposium is supported by the members and Board of Texas Dance Hall Preservation, Inc. and Texas Folklife, by a grants from Humanities Texas and Texas Commission on the Arts. Additional support is provided by regional businesses including Sengelmann Hall and Texana Country Inn. About Texas Dance Hall Preservation, Inc.
Texas Dance Hall Preservation is committed to saving historic Texas dance halls and the authentic music and culture that is still found in them. We accomplish this mission by: Developing informational programs to promote public awareness and use of Texas dance halls as living venues for community assembly, music, and social dancing; keeping an inventory of all traditional dance halls in Texas, including those that have been lost; documenting and publishing the history of Texas dance halls; serving as a clearinghouse for information that can aid the preservation of Texas dance halls; providing assistance to list dance halls on the National Register of Historic Places or to complete grant applications for preservation projects; providing financial, technical, or organizational assistance for the restoration, rehabilitation, and preservation of historic dance halls. Texas Folklife is a statewide non-profit organization dedicated to presenting and preserving the diverse cultures and living heritage of the Lone Star State. For more than 25 years, Texas Folklife has honored the authentic cultural traditions passed down within communities, explored their importance in contemporary society, and celebrated them by providing accessible and joyful arts experiences. It is located in Austin, Texas, in the SoCo neighborhood—one of the city’s vibrant commercial and arts district.